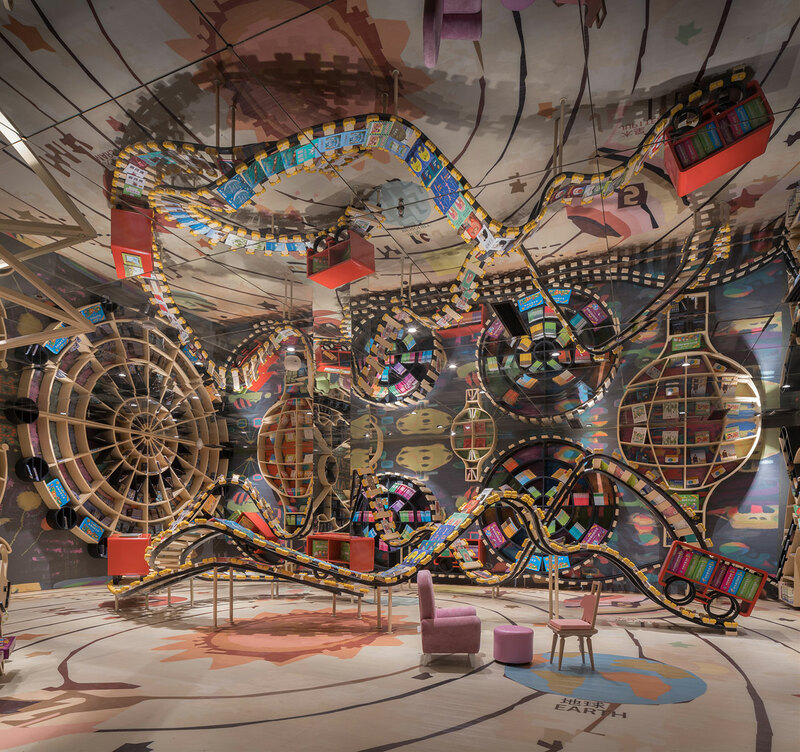 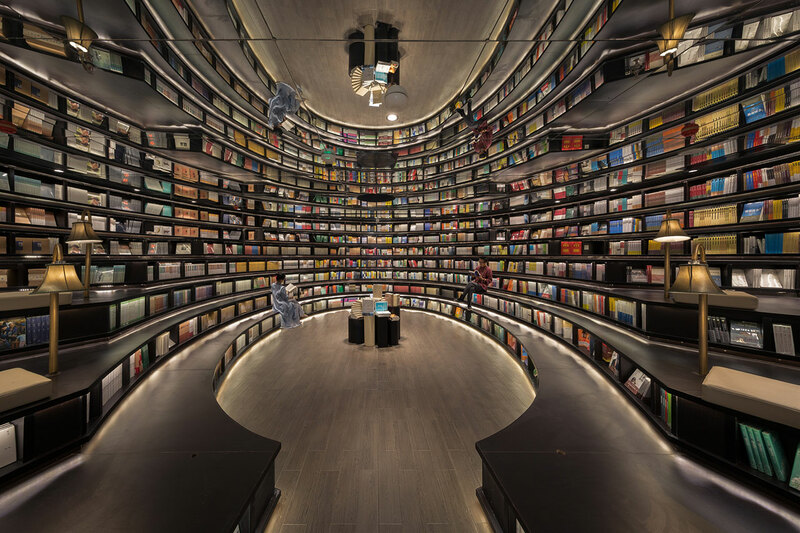 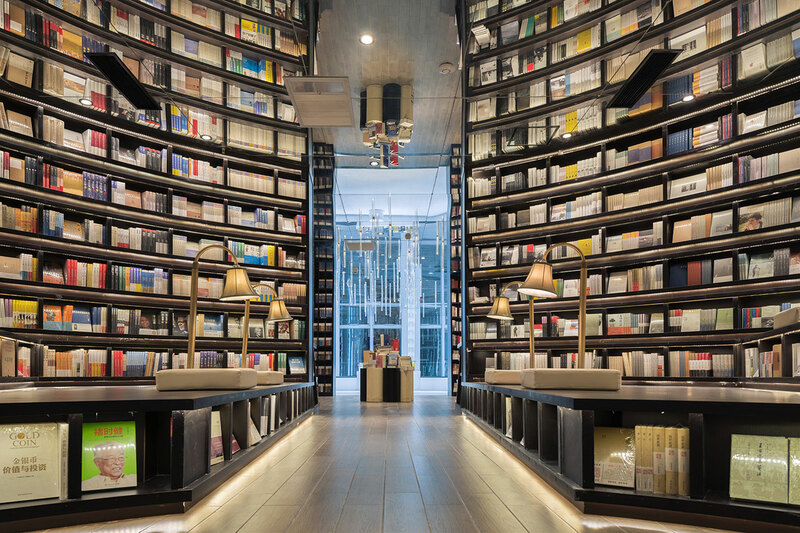 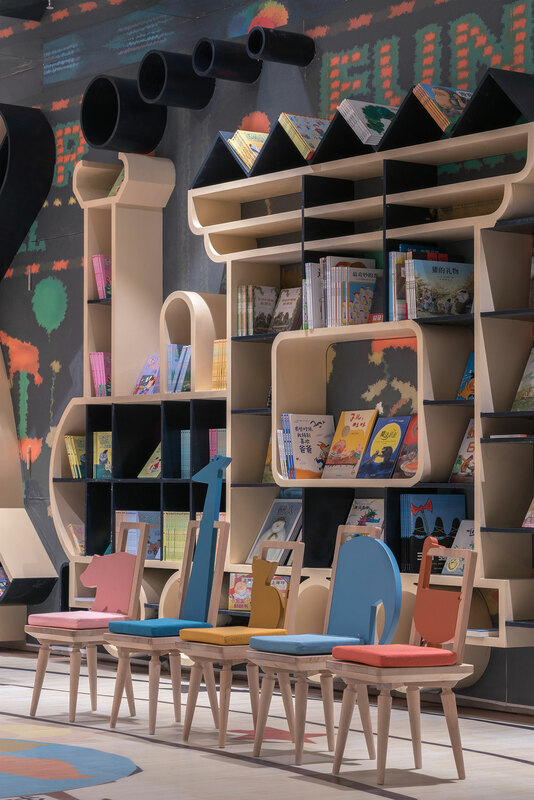 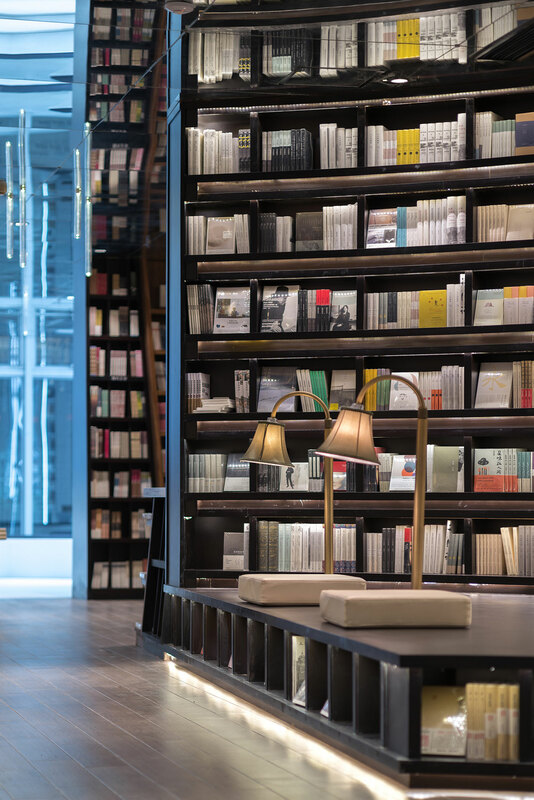 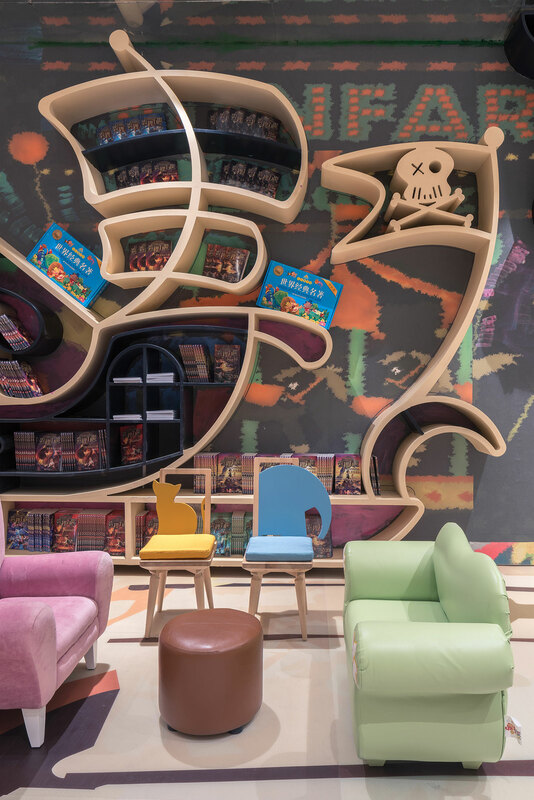 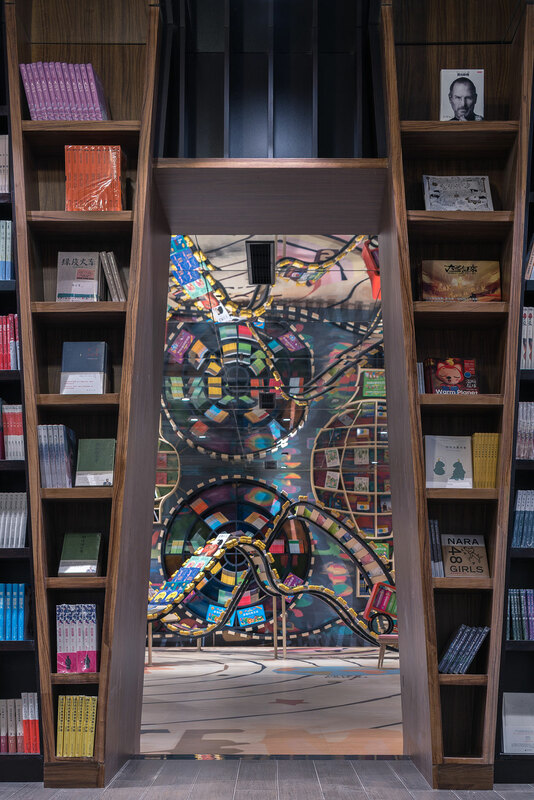 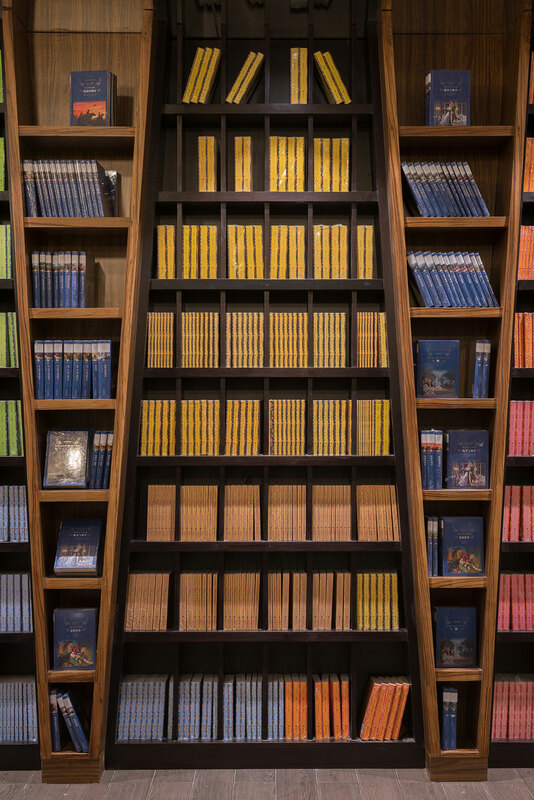 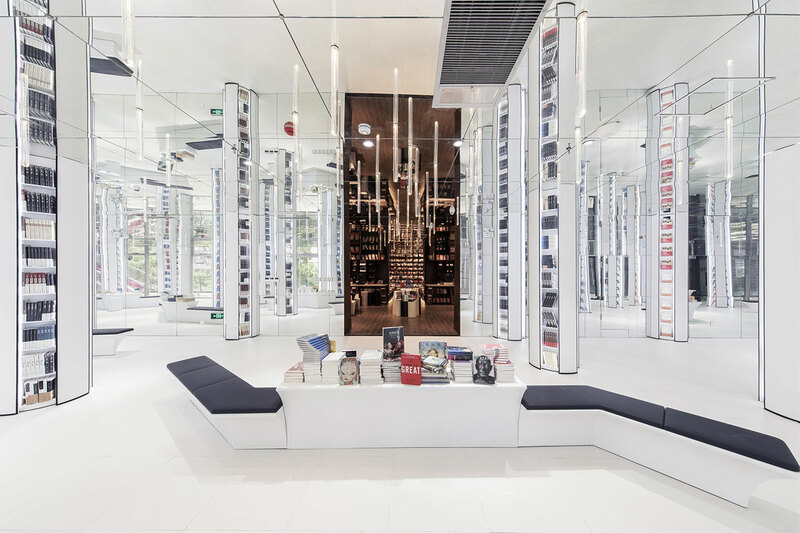 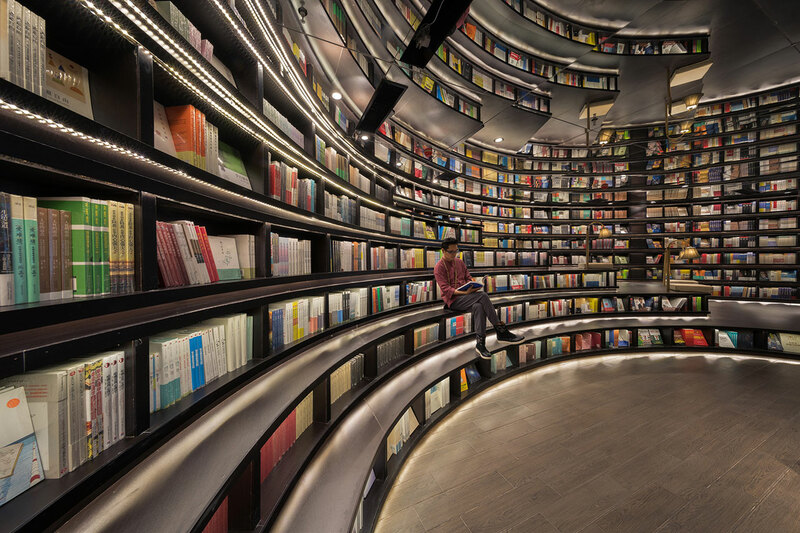 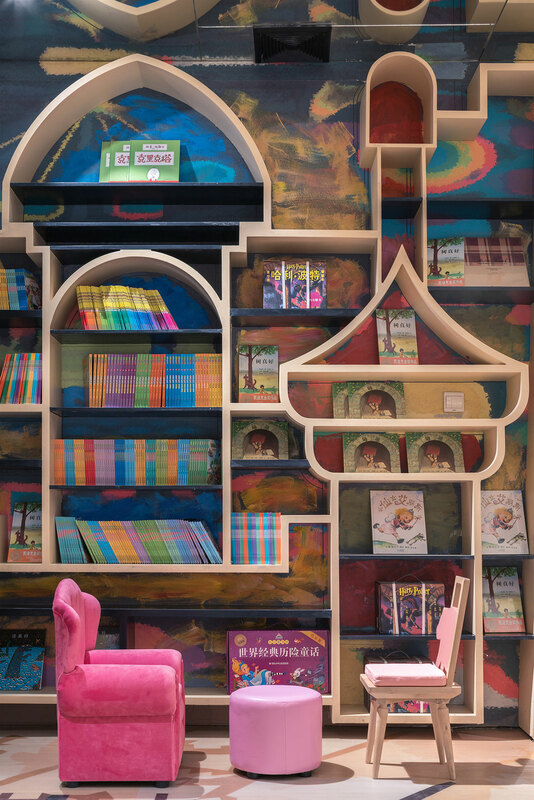 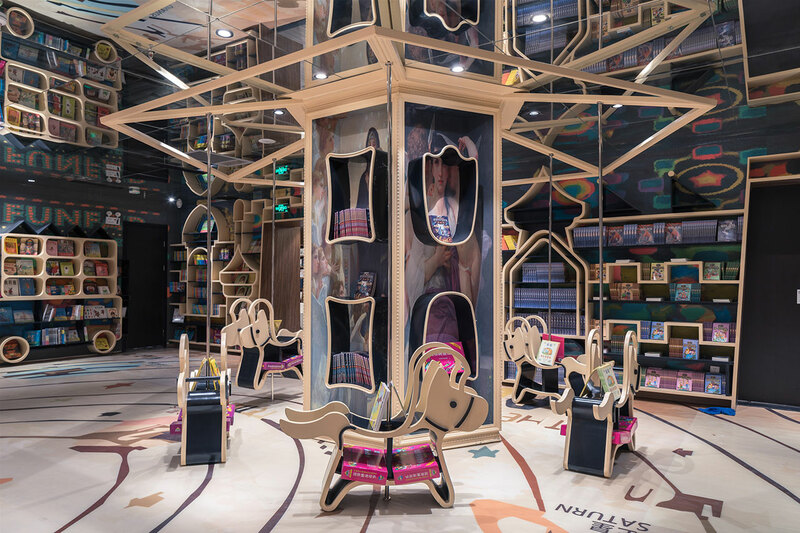 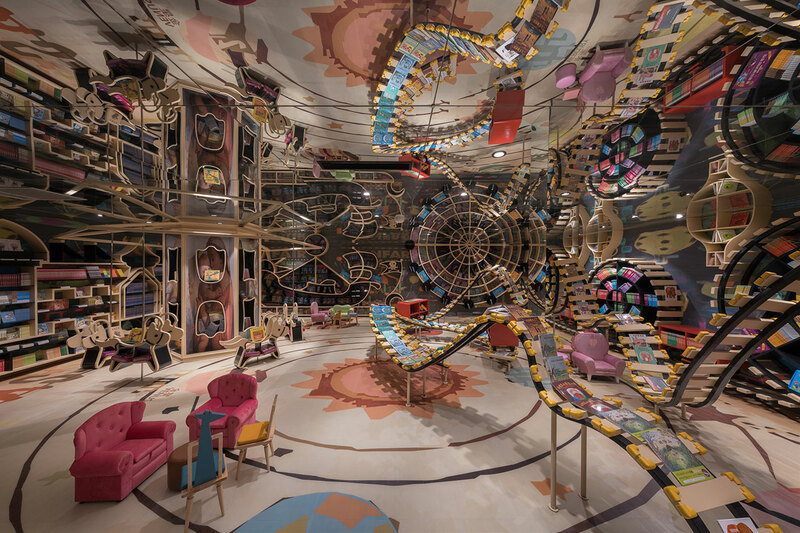 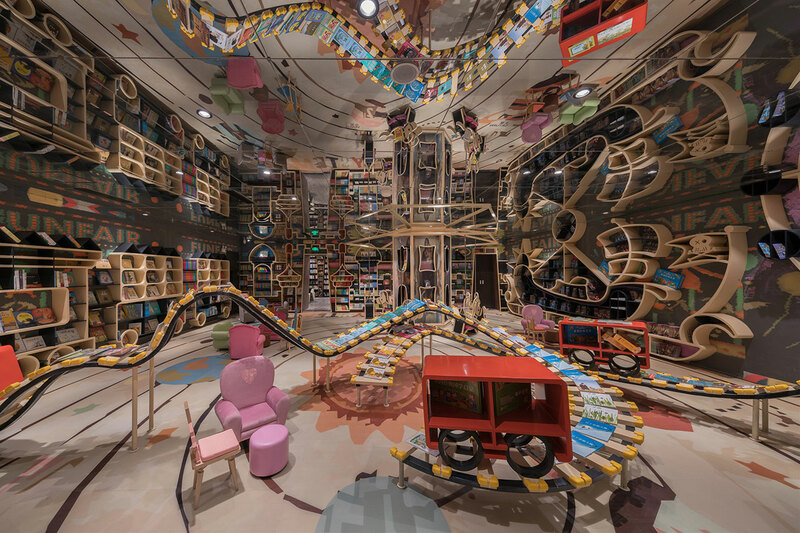 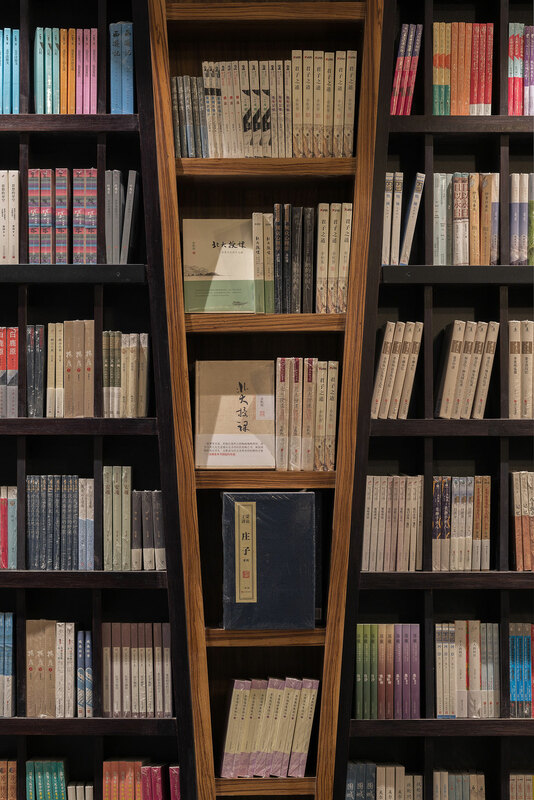 Imagine a movie set where 2001: A Space Odyssey meets Hogwarts School of Witchcraft and Wizardry and you get an idea of the new Zhongshuge bookstore in Hangzhou, China. 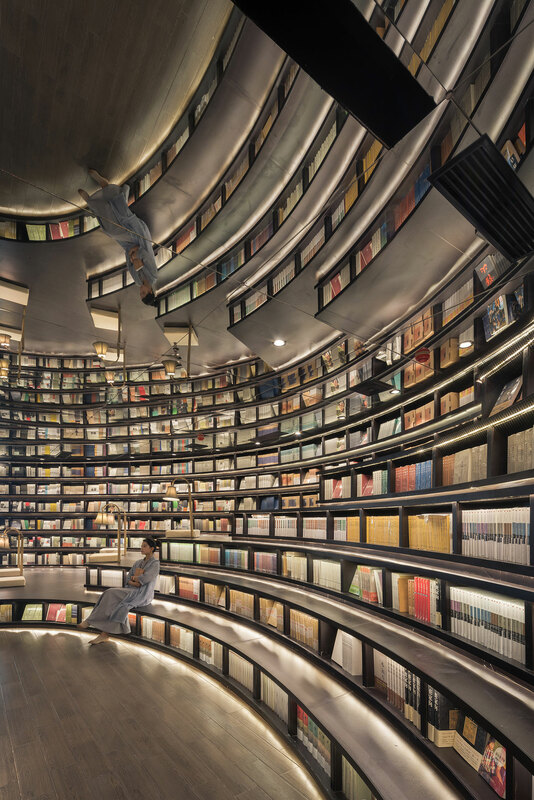 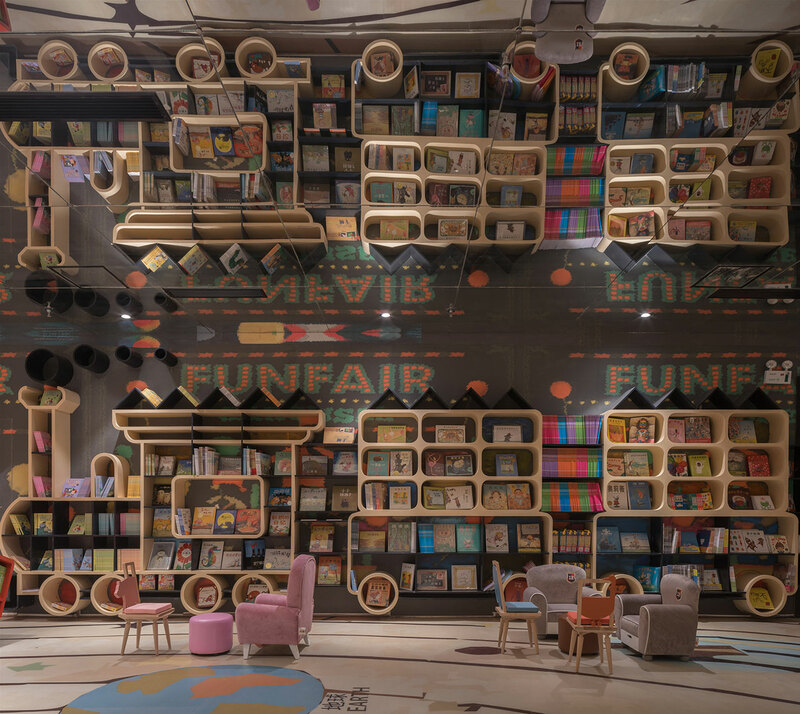 Designed by Shanghai-based architectural studio XL MUSE and located within the Star Avenue shopping complex, this extraordinary bookstore manages to transport the visitors out of their mundane reality and into an immersive realm of unbound fantasy, just like a good book of fiction is supposed to do. 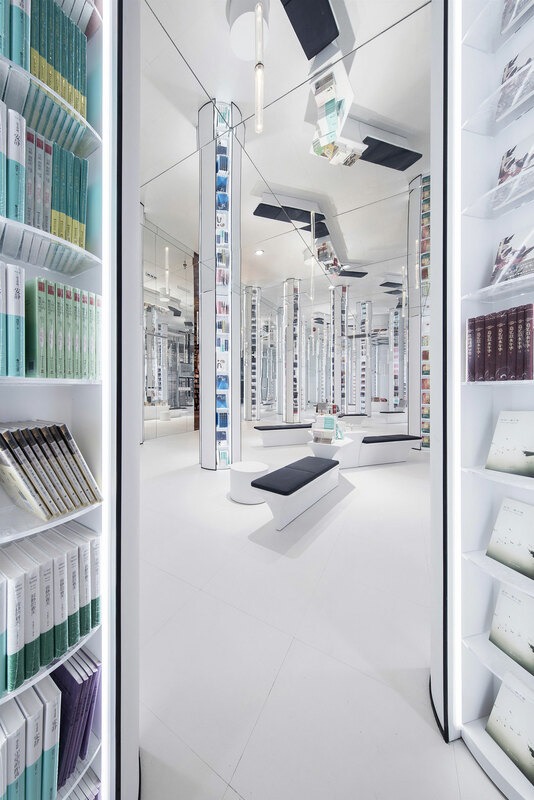 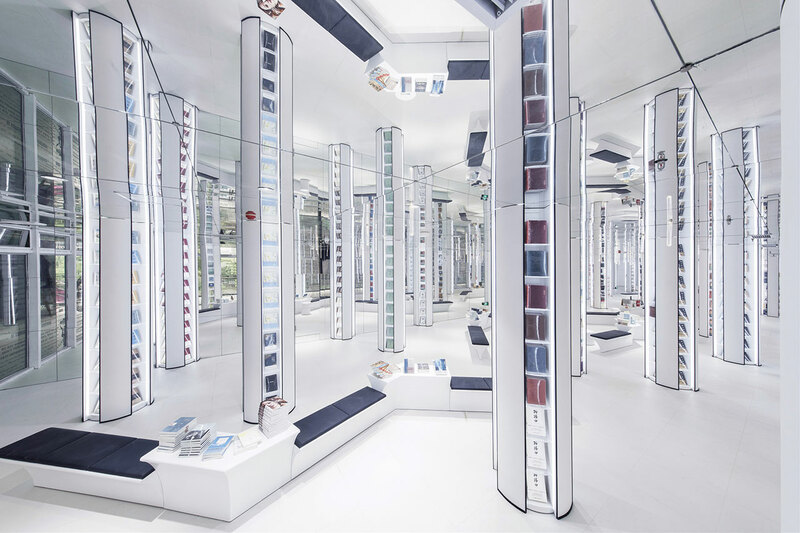 The store is comprised of four distinct spaces. 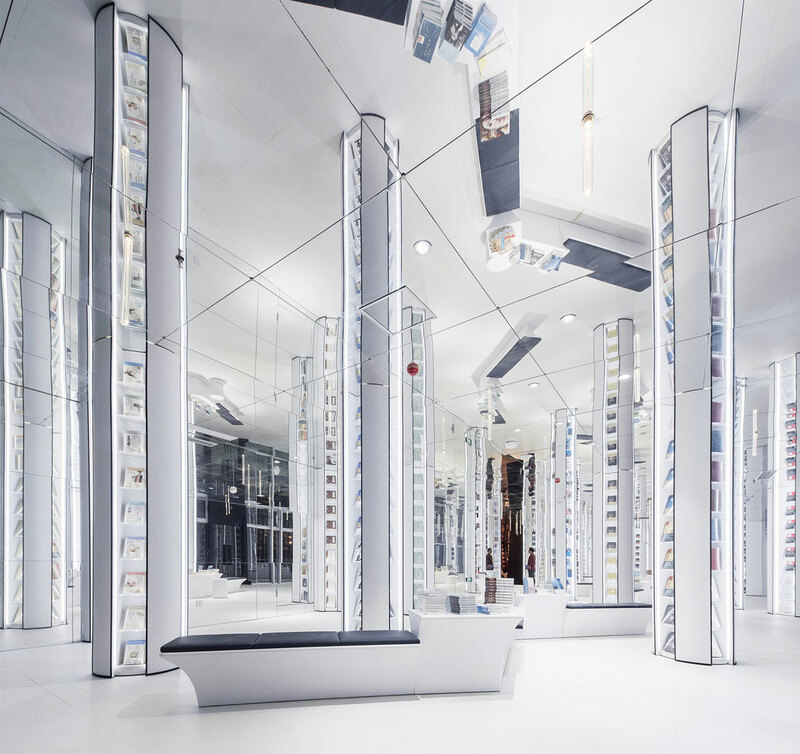 Visitors are first welcomed by a glass facade covered in multi-lingual text behind which stretches an all-white, futuristic hall of cool brightness. 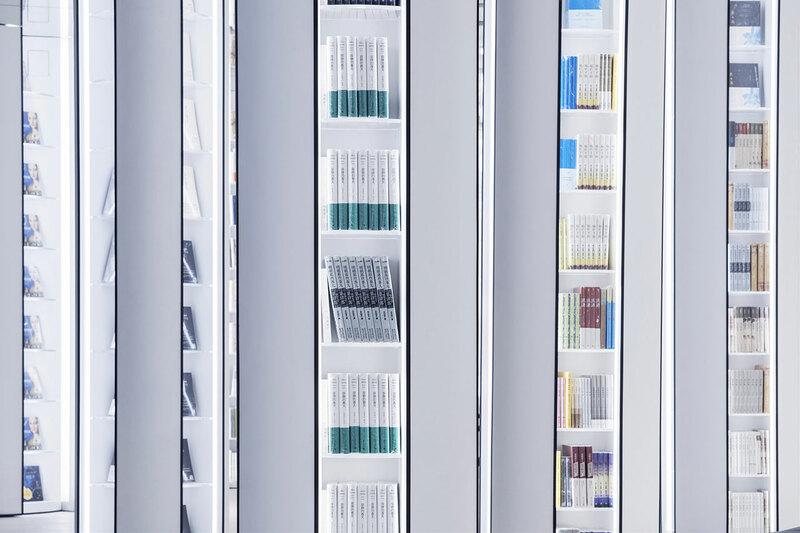 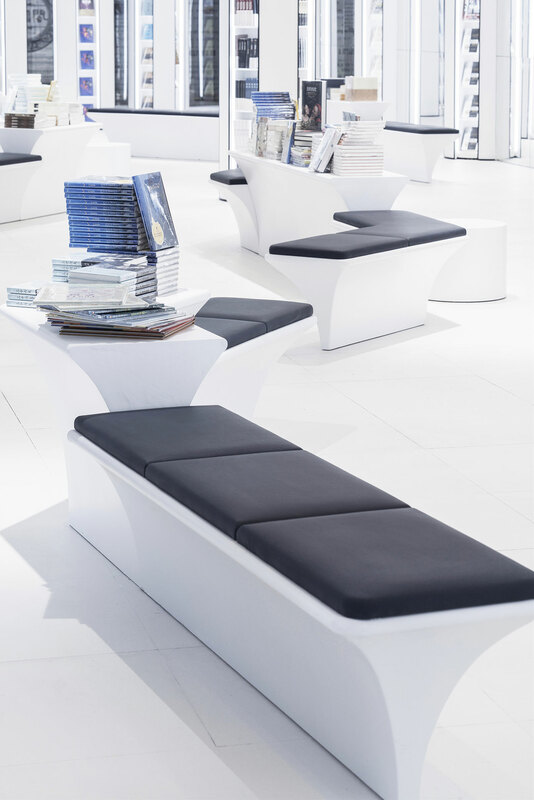 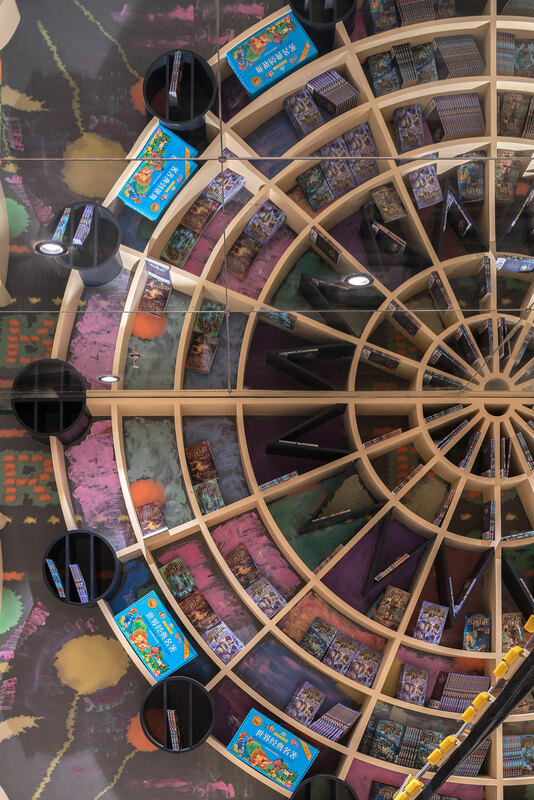 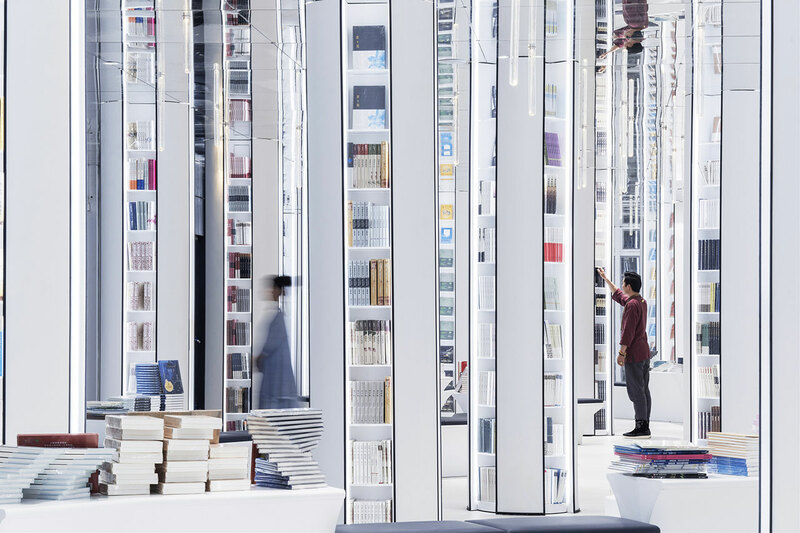 Populating this space are randomly placed circular columns, displaying books in illuminated vertical shelving, and slender benches zigzagging through them. 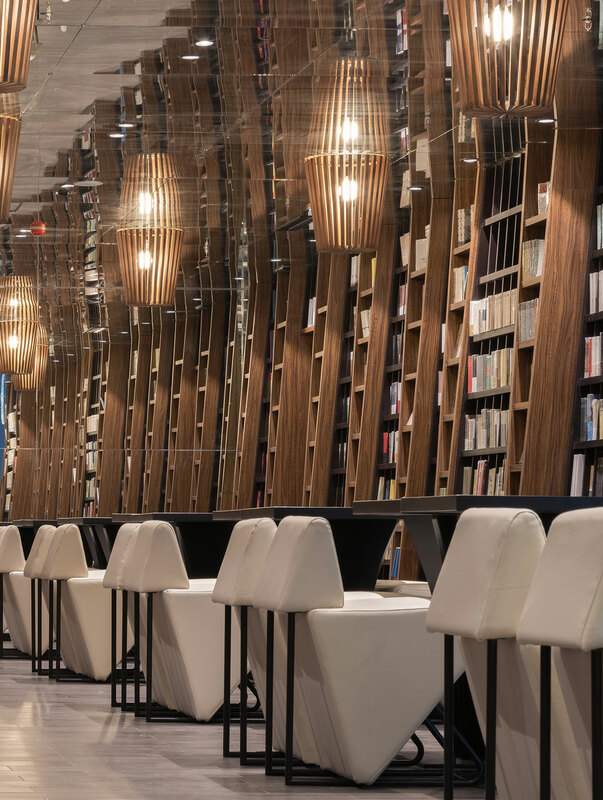 The designers’ intention behind this arrangement is to evoke a forest where “tree-like pillars”, as they poetically phrase it, “stand tall and emit the light of knowledge” and standing tall they do as they are reflected upwards by the mirrored ceiling which, along with the mirrored wall at the back, make the space seem of endless dimensions. 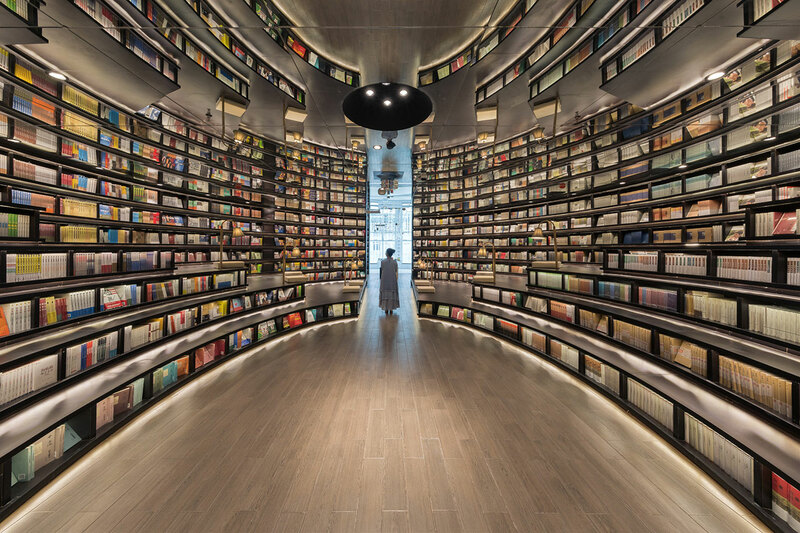 Next is the “Reading Corridor”, a much darker space with full-height wooden bookcases extending “endlessly” on both sides and geometrical seating along its longitudinal axis. 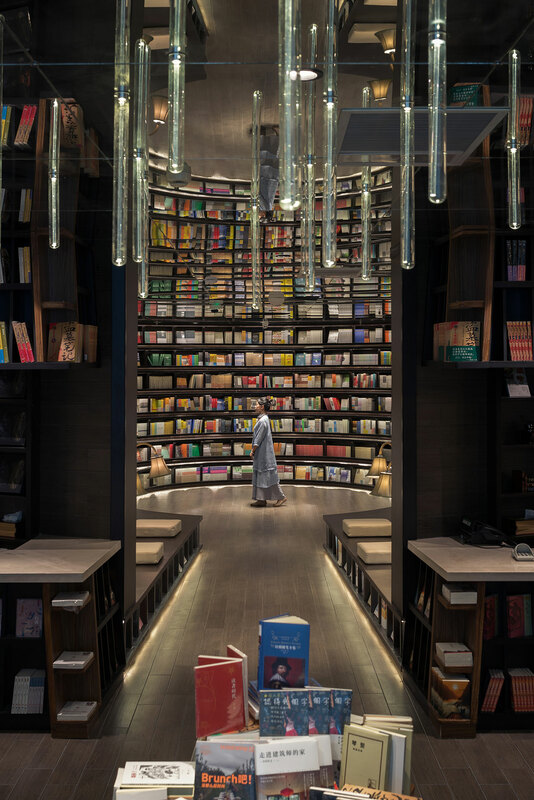 Here, the mirrored ceiling provides continuity from the previous space as well as creating the impression that the light fittings magically hover in midair like sky lanterns. 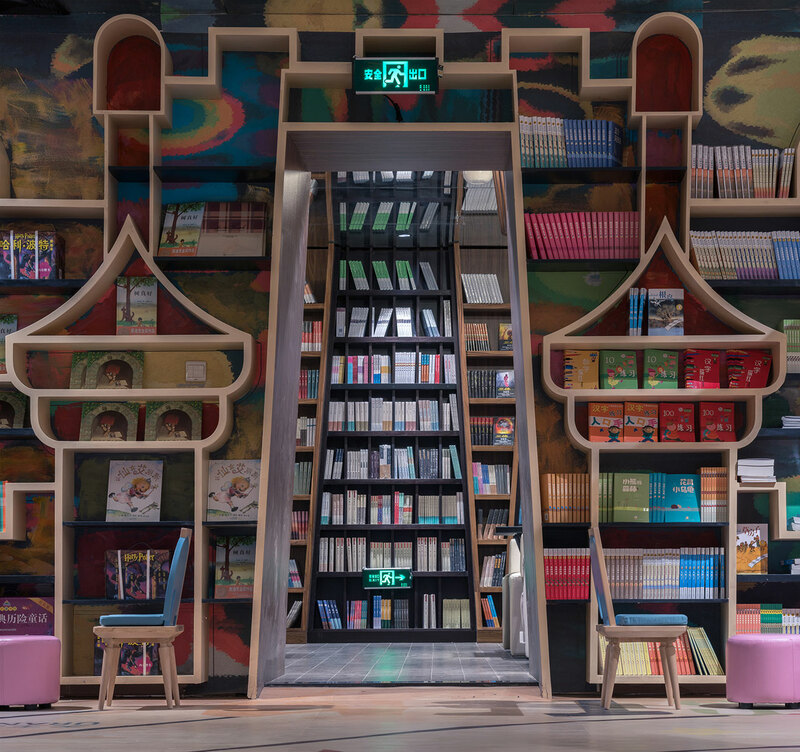 Through a central doorway, the visitors then enter the “Reading Theater”, an oval space of similar aesthetic of dark shades and soft, warm lighting, with book-shelves and stepped seating lining the curved walls where padded cushions and reading lamps give the space a more relaxed, intimate feel.